Harriet Pentney was our own local heroine - the Hoxne Angel. She devoted her time to caring for those in need through assistance during illness and distribution of puddings, porter, wine and beef tea under the guidance of the Kerrisons of Oakley Park and the clergy. A member of the Hoxne Heritage group recently acquired 2 log books kept by Harriet, indeed the photograph of her shows her holding one of these. Very quickly it has become clear that this lady is an unsung heroine, "an angel" as coined by a member of our group. Harriet's accounts predate our NHS. It was a Dickensian time when help for the poor was given charitably at Parish level. She would have been the sick nurse for most of us if we lived here at that time. Harriet often referred to regular trips to a dispensary in Eye by pony and trap and then taking medicine to patients within our Parishes. 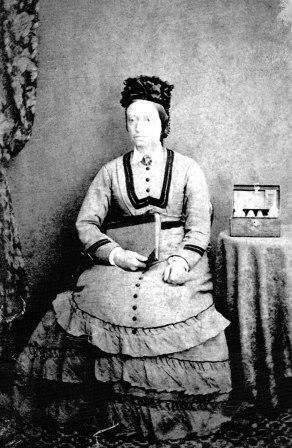 She was our Parish sick nurse, born Harriet Cobb, in 1831 at Ixworth, Thetford. She married her first husband, John Pentney in 1852 whilst living at Great Barton. In the 1881 census she was living in Low Street Hoxne. She married a second time in 1882 to William Hines and was living with him at Heckfield Green as recorded in the 1891 census. Harriet had 4 children, Maria, Harriet, Agnes and Harry. She was nursing at Oakley Park from at least 1869 until 1882. Her orders were received from Mrs Paget, the Vicar's wife as well as direct orders from Sir Edward and Lady Caroline Kerrison. Harriet would have had no formal training. Harriet herself was a rather sickly lady - at least one bad cold a month and frequent neuralgia. On one occasion she had to see the doctor who confined her to bed with a bad head and kidneys out of order for 6 days. Despite this, she always sent her daughter Agnes to check her patients if she was poorly. We think she was still working when she died aged 61 because in the 1891 census she was mentioned as a nurse and midwife. When she died on the 23rd July 1892 she was buried in Hoxne graveyard - as yet, we don't know where her grave is - if anyone can help to throw light on this we would be most happy to receive it! Harriet refers to these records as "log books". In truth, she expresses her feelings clearly and these records are more a journal or diary than a log book. These are a meticulous and highly touching insight into our parishes in the last quarter of the 19th century. Many places which we know are mentioned, local families who have lived in this area for generations are recorded, many of the houses we live in today were visited. Under the floor boards of the house in which I now live in Low Street we found some medicine bottles for a "Mr Shulver" the labels written in the same handwriting as Harriet's log book. We managed to find the records of her earlier visits to his wife, who sadly died. Frustratingly, a third and final log book is missing but rumoured to be somewhere within the Parish, this would have recorded the visit to Mr Shulver and the dispensing of his medicine. It would probably mention her second marriage of which we know no more details. Did she die in post? We just don't know. Does anyone have information on this? Has anyone any other sources relating to Harriet or her tending to your families - we would love to hear from you! In her log books two doctors from Eye are mentioned, they were called in the most serious cases or when operations needed to be performed, Harriet assisted examples of operations including tumours, ruptures and tooth extractions. Chloroform was used as an anaesthetic. In 1872, when her "ground rules" were established the average life expectancy was 44.27 years for females and 41.17 years for males. She recorded frequent deaths in our villages, many who were under 30 years of age. There were no antibiotics or vaccinations in those days. Consumption (TB) was rife, measles and diphtheria common and caused deaths in children. Scarlet fever, typhoid fever, influenza, cancer, polio and heart disease are all mentioned and encountered by her amongst many other ailments. Pregnancy in those days was very hazardous. She had her work cut out for her! She carried it out relentlessly and selflessly. These included: application of leeches for swollen joints, arrowroot and cornflower for diarrhoea, cod liver oil but mostly they were porter, brandy, gin and portwine! - even for children as it would dull the senses and relieve pain temporarily. At times her log book reveals she was "quite upset"
One lady who lost her only son - she followed her up for two and a half months. She took fruit and flowers to Alice Saunders and Mrs Bootman - both were "brightened at the sight of them". One old lady she described as "A dear old soul, anxious to see me as often as I can". She stayed as often as she could until she died 2 weeks later. She took patients out for rides in her trap to get fresh air. One lady with TB died - she made a wreath and cross of flowers for her coffin. She often attended funerals. There are several references of Harriet having a dilemma about balancing her own need to rest, or the needs of her family and ignoring those with only small ailments or hypochondriacs. "20th December 1880 - Sad news from my mother - she is in a very bad state but I could not very well go to see her in Bury St Edmunds, but was very anxious." "12th Janury 1881 - Several patients in a dying state so had to stay with them overnight. Very anxious about my dear mother." "14th January 1881 - Had a letter to say Mother was dead and wanted to go to her. Mr Cracknell was very ill so had to get another woman in. He did not care for her so I had to stay." Then she was collected to see another man who was ill, so she stayed until it was all over. "16th January 1881 - Went to Bury St Edmunds and buried dear mother." "19th January 1881 - Back to work - I didn't feel at all well." "21st January 1881 - Mr Cracknell's funeral." "23rd January 1881 - Mrs Laws dying so stayed until she was gone, then did for her. It seemed hard to witness after losing my own mother." "25th January 1881 - Got some linsey for the (Laws) children so was very busy sewing for them to get them ready (for the funeral). I worked hard to do it being 5 girls and 2 little boys." There are similar pattern of events surrounding the serious illness of her son - she found it difficult balancing her community work and that of her family. What is clear from her log book is that she had a strong belief in God, a Christian conviction of kindness, charity, mercy, sympathy and compassion. She eased people out of this life as they embarked on the journey to the next. She wrote about one dying patient. "It will be a happy release when it pleases God to call him." Talk given by Richard Giffin at St Peter and St Paul Church in Hoxne on the 15th February 2015. Picture and information provide by Margaret Sillis.